I've raved about the greatness of the first Mega Food Tour, well, now its even better with the Mega Food Tour 2.0. Experience Megamall's nine finest, newest and hottest eats. Be part of the Mega Food Tour 2.0 with the Mercato Centrale Food Group and Our Awesome Planet on Septermber 29 and 30, 2014 by once again just taking food pics from any SM Megamall restaurant. Follow, tag @sm megamall #MegaFoodTour2.0 and post your best photo on instagram from Sept. 19 to 27, 2014. So here's a sneak peak of what's in store for you. Linguini Fini is a Hong Kong-based international franchise serving authentic Italian fare by using organic ingredients and applying its nose-to-tail philosophy as their distinct edge. Thus, you are assured of a bold, fresh, and clean flavors from the best ingredients prepared the traditional way. This is definitely the best stop! Rosanjin is named after Japanese artist particularly a potter and calligrapher, Rosanjin Kitaoji. He is also a well-know gourmet whose quest for good food made of quality ingredients was extraordinary that he opened a high-end restaurant for members only in Tokyo. He makes use of his artistically-made ceramic potter. Ippudo having earned rave reviews from Zagat and received the acclaimed Yelp 2010 Best Restaurant in the USA, is now here in Manila to raise the standards of Philippine ramen culture. Ippudo lets you in to the secret of finding that perfect bowl with its broth, noodles, chashu and ajikukage. 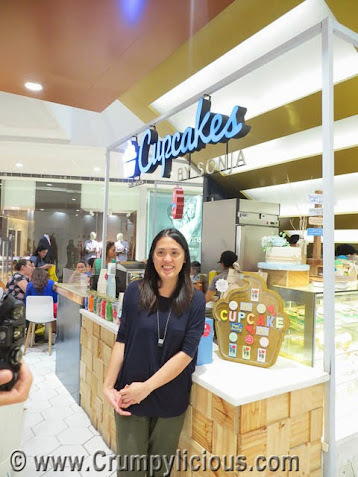 Cupcakes by Sonja and its famous Red Velvet Cupcakes needs no further introduction as its one of the pioneer cupcakes store here in the Philippines. A repeat inclusion in the tour is Tim Ho Wan. It's so good you'd want to try their buns as much as you can! Canada’s very first drive-in restaurant, Triple O's by White Spot and claims to have the “sauciest, juiciest, tastiest, bestest burgers around” is now in Manila! Aside from its Megamall Atrium branch, it will also open on October 23 at SM Aura Premier. Eri Curry is a curry shop customized for the Filipino taste buds. It also allows customization in its meals by choosing your spiciness level and toppings. Kool Kids Ice Cream is no ordinary ice cream as it is made from Nitrogen. This is their second branch. The pioneer branch being in Kapitolyo. Mochicreme Cafe offers delicious matcha sweet treats and drinks with a nice and comfy ambiance. So what are you waiting for? Keep on taking your photos and join now! Tous Les Jours opens at the lobby level of Trinoma in Quezon City. The store marks the opening of its 14th store in the Philippines. I'm glad we were invited to witness the opening celebration. As opening guests, we were given the chance to have a bread buffet. While the first 100 customers were given a free heart-shaped cookies without any minimum purchase requirement. If course, we picked our usual favorites and tried new ones too. We also watched a decorating demo by the Zombettes' Ornusa Cadness and Sanya Smith together with TLJ's esteemed cake decorating specialist, Kelly Mambong. They successfully decorated the Tous les Jours Rose Inspiration Fresh Cream Cake with ease. Like the Jazz Mall branch, this also has a cafe-style dining area. This is very convenient since it's near the Trinoma drop off point so you can chill there while waiting. With more branches, Tous Les Jours freshly baked breads are more accessible to its growing number of loyal customers. Pyrotechnics vendors may ask event planners to "contact us" for the sparklers that add a bit of magic to a wedding ceremony. They are a step above the tossing of rose petals or the releasing of butterflies. As handheld treats, sparklers are a way for everyone in the audience to participate in the ceremony. There are other applications, however, where they seem to make their biggest light. Some brides and grooms choose to put their sparklers on the wedding cake. This moment is one of the highlights of the reception. It is the time for iconic photographs and the bride and groom to have some playful interaction with one another. What better way to signal the arrival of this moment than with sparklers fizzing from the cake. It heightens the excitement of the guests. Another way to use sparklers for a wedding ceremony is to signal the send-off of the bride and groom after the reception is over. Whether there is a limousine waiting or the couple has a car of its own, sparklers can light the path the leads away from the festivities. This is an installation that should probably be completed by a professional who understands local fireworks laws and who is trained in pyrotechnics safety. Sparklers should be kept away from high grass and flammable materials, and they should never be left unattended. One other way sparklers have been used by wedding attendees is on the dance floor. It is romantic to see couples moving lights across the floor as music plays gently in the background. This can make the guests feel like they are having their first dance along with the bride and groom.